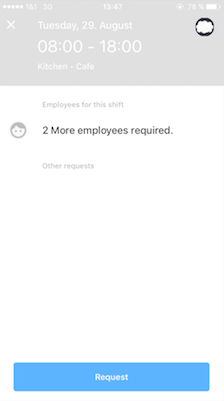 Of course the employee app offers the possibility to apply for a free shift or to request a swap. If you want to apply for a shift simply click on one that is grey and without a tick symbol. A new window will open where you can click on "request". If you want to trade a shift you have been assigned to click on a shift that is blue. 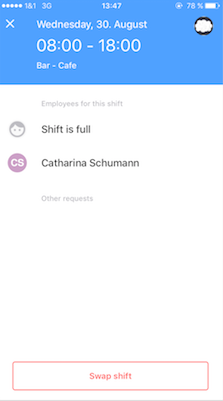 An new window will open where you can click on " swap shift"
After you have confirmed that you want to swap this shift, all relevant employees will be informed via push notifications. You will stay assigned to this shift until someone agreed to take over.